Kärcher’s new, especially energy-efficient dry vacuums, the T 7/1 und T 10/1 eco!efficiency, run on just 750 watts. Thanks to improved flow characteristics, they require 40% less energy than vacuums with comparable cleaning power, which benefits the environment and cuts electricity bills. One innovation in both models compared with the established T 12/1 eco!efficiency is a pluggable mains cable. Being especially easy to change, it saves customers time and service costs. Another major advantage is a low noise level. Noise emissions of only 60 dB(A) for the T 10/1 and 62 dB(A) for the T 7/1 make the new Kärcher vacuums suitable for use in noise-sensitive areas and for cleaning during business hours. They are especially suitable for contract cleaners and for use in hospitals, retirement homes, retail outlets and hotels. Depending on user requirements, 7l and 10l containers enable medium to long working intervals. The vacuums are equipped with a tear-resistant fleece filter bag that accommodates more than twice as much dust as a paper filter. The washable, permanent main filter is made of especially dense fleece material that also makes it possible to vacuum without a dust bag, making the T 7/1 and T 10/1 eco!efficiency even more cost-efficient to run. 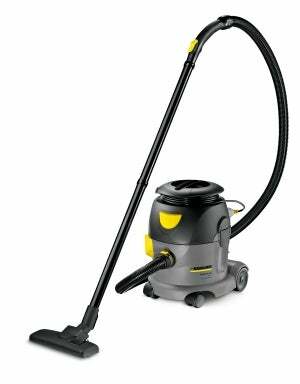 Weighing just 6kg and 6.5kg, the vacuums are easy to switch on and off by foot control. These compact appliances owe their good rolling properties to a robust chassis with rubberised fixed and swivel castors. The T 10/1 eco!efficiency’s 12-metre mains cable winds up completely round a bracket set into the turbine head, while the entire length of the T 7/1 eco!efficiency’s 7.5 m cable winds eas-ily and conveniently round a cable hook. A handily shaped handle on the top of both machines makes them easy and convenient to carry up and down steps and stairs.